The Second Judicial District Commission on Judicial Performance, on a 10-0 vote, recommends that Judge Michael J. Vallejos BE RETAINED. The Governor appointed Judge Vallejos to the Denver District Court bench in December 2010. Prior to his appointment, Judge Vallejos served as a Deputy State Public Defender and the head of the Denver office. 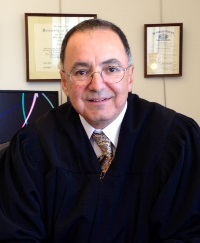 Judge Vallejos earned his undergraduate degree from the University of Colorado in 1984 and his law degree from the University of Colorado in 1991. Since his appointment to the bench, Judge Vallejos has demonstrated his commitment to judicial education through his participation at conferences and continuing legal education panels. The Judge also serves on the board of directors of two non-profit organizations. During the current term, Judge Vallejos presided over criminal and domestic relations matters. In the surveys of attorney and non-attorneys, Judge Vallejos received an overall combined average rating that slightly exceeded the average combined rating of all district court judges standing for retention. Attorney assessment of Judge Vallejos’ performance was slightly lower than average. Non-attorney jurors rated him slightly above average while the remaining non-attorneys surveyed rated him slightly below the averages for district court judges standing for retention. Judge Vallejos received average marks on questions related to communication, demeanor, and diligence, and slightly lower than average marks in case management and overall knowledge and application of law. Written survey comments and Commissioner observations of Judge Vallejos in court were consistent with the numerical scores. Attorneys described him as fair, thoughtful, patient, and respectful. Non-attorneys praised Judge Vallejos as fair, compassionate, calm, and professional. Some attorneys expressed concern that, on occasion, Judge Vallejos’ efforts to put parties at ease might come at a cost of consistency and clarity. Commissioner observations of Judge Vallejos’ courtroom and evaluation of written work suggest he could improve in this area. Judge Vallejos’ documented strengths support the Commission’s recommendation.